Posted by admin on July 17, 2010; This entry is filed under Design Role Analysis, Envisioning, France, Nord-Pas-de-Calais, Periurban Area, Pévèle, Pévèle > Periurban area > Nord-Pas-de-Calais > France. The main design exercise and output of the exploration workshop was to generate as many service ideas as possible towards a more sustainable quality of living in the Pévèle area. A selection of promising cases of social and public services innovations were given as starters to stimulate the brainstorming between the students. All tentative services ideas generated were immediately formalised through the realisation of a short video sequence mimicking the interview of a typical user in context. After 3 days of intense work, more than 30 different sequences were generated. The wrap-up phase of the workshop objective was to integrate all these creative inputs gathered in this video-sketch brainstorming into a coherent vision for the Pévèle area. 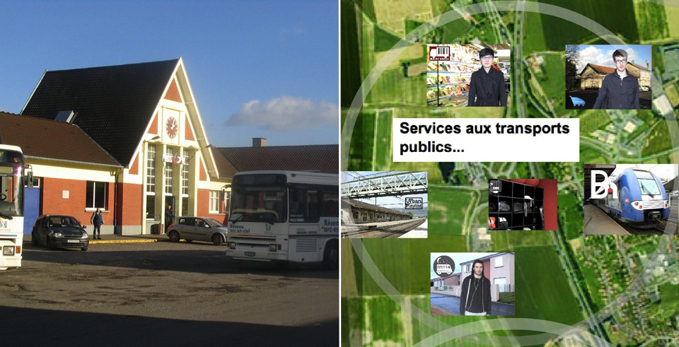 Service ideas were organised in clusters around 7 strategic points and localised on a map of the Pévèle area: supports for commuters around the local train station; revitalisation of local farming through a combination of short food circuits and hosting of local tourism; development of local activities and of an information network to enhance social life between inhabitants; etc. The strategic point generated constitute a first attempt to suggest possible area for the definition of framework projects and stimulate the strategic conversation about it among the different local stakeholders and promoters of sustainable transformation of the periurban areas.